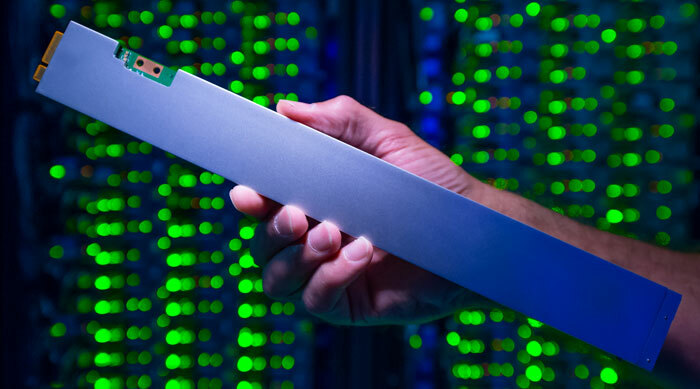 A year ago Intel first revealed the 'Ruler' form factor for server SSD storage. Yesterday, as part of its data-centric Innovation Summit at its headquarters in Santa Clara, CA, it revealed the a SSD DC P4500 Series Ruler drive. This SSD, about the same length and width as a 12-inch / 30cm ruler, is claimed to be the "world's densest, totally silent solid state drive". It can store up to 32TB of data, which Intel informs us is "equivalent to triple the entire printed collection of the U.S. Library of Congress". Intel doesn't list the new 32TB Ruler on the SSD DC P4500 Series product pages as yet. If you head on over to that page you will find just 4TB and 8TB versions of the Ruler at the time of writing. The only details we have right now about the 32TB Ruler are via the Intel Newsroom. Providing some background to the bumper 32TB new member of the SSD DC P4500 Series, Intel says it is its densest drive ever. Inside the Ruler are Intel 3D NAND chips, built using memory cells stacked 64-deep. An important reason why companies that run/need servers will choose the new 32TB Ruler drives are that it can facilitate Petabyte of storage in a single server slot (32x 32TB Rulers in a row). Another quality of the Ruler is that compared with traditional SSD designs it "requires half the airflow to keep cool," says Intel. With data centres spending a large portion of their budgets on air conditioning, the Ruler could bring surprising savings in this area. 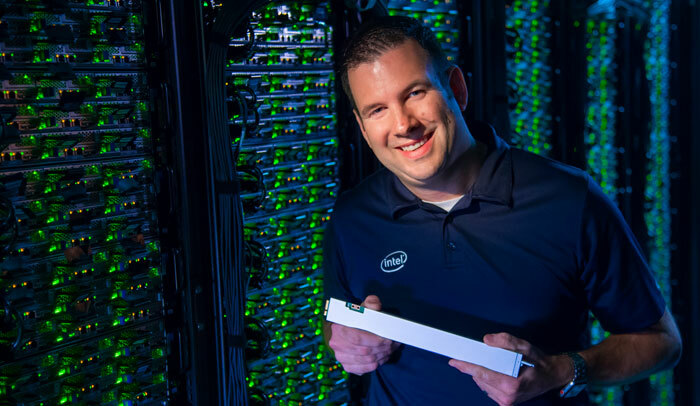 You can read more about the new Ruler and its design in an additional Intel blog post highlighting the work of Wayne Allen, director of data centre storage pathfinding, Non-Volatile Memory Solutions Group at Intel. Also at the Innovation Summit yesterday, Intel revealed a 'sneak peek' of its plans for Xeon processors through to 2020. TechReport shared the roadmap graphic, like the one below, and provides some details from the presentation. In the above you can see that Cascade Lake Xeon Scalable processors will be shipping in Q4, just a few months from now. These 14nm processors will integrate a new memory controller to support Optane Persistent Memory DIMMs. Furthermore, DLBoost:VNNI will be introduced to accelerate Deep Learning. Last but not least, these will be the first Intel processors to include hardware-level mitigations for Spectre and Meltdown vulnerabilities. Copper Lake will continue on 14nm next year and Intel highlights support for fast DLBoost: bfloat16 floating-point support, useful for AI-related workloads. At long last, sometime in 2020, Ice Lake Xeon processors will arrive, debuting on Intel's 10nm process technology. Intel Optane DC persistent memory starts at $6.57 per GB Gigabyte Aorus RGB AIC NVMe SSDs listed Intel Core i5-9400 PC Specialist Vortex S1 Has Samsung been chosen for Intel Xe GPU manufacturing? I would have thought the meltdown resistant Xeon would be the real headline here. -> Cascade Lake is a future Intel Xeon Scalable processor based on 14nm technology that will introduce Intel Optane DC persistent memory and a set of new AI features called Intel DL Boost. This embedded AI accelerator will speed deep learning inference workloads, with an expected 11 times faster image recognition than the current generation Intel Xeon Scalable processors when they launched in July 2017. Cascade Lake is targeted to begin shipping late this year. -> Cooper Lake is a future Intel Xeon Scalable processor that is based on 14nm technology. Cooper Lake will introduce a new generation platform with significant performance improvements, new I/O features, new Intel® DL Boost capabilities (Bfloat16) that improve AI/deep learning training performance, and additional Intel Optane DC persistent memory innovations. Cooper Lake is targeted for 2019 shipments. 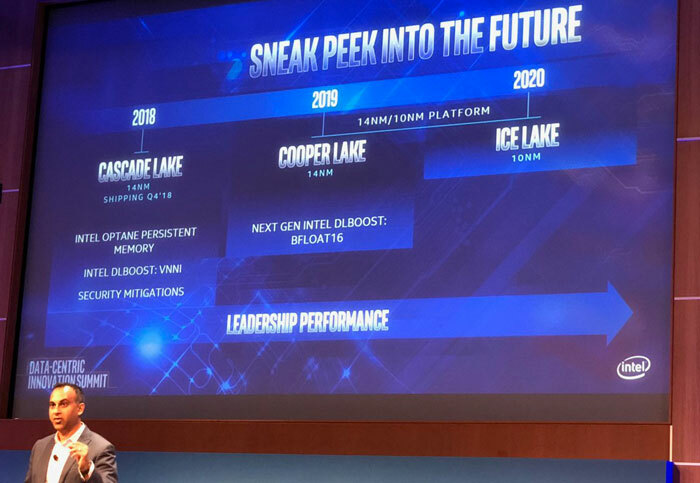 -> Ice Lake is a future Intel Xeon Scalable processor based on 10nm technology that shares a common platform with Cooper Lake and is planned as a fast follow-on targeted for 2020 shipments. Reminds me of the 5ghz, 28 core processor that Intel ‘released’ a few weeks ago, that needed an industrial chiller, and custom MB to work. If you can't win a fair fight, have an unfair one. And then attempt to adjust the rules to justify it as fair. Of course in this case it seems to be that Intel SSDs compete sort-of-favourably in certain tasks but have lower capacity, AIUI. So..
Really great, it will be nice to see mechanical hard-drives gone one day. And, i think ill wait it out for Copper Lake.